Preparation: Sift the flour in a large, rounded bowl (and add the sugar and the vanilla if you are preparing the sweet version), add a pinch of salt and the milk and mix with an electric or a hand beater. In another, smaller bowl, mix the eggs until they become an homogenous, creamy mix. 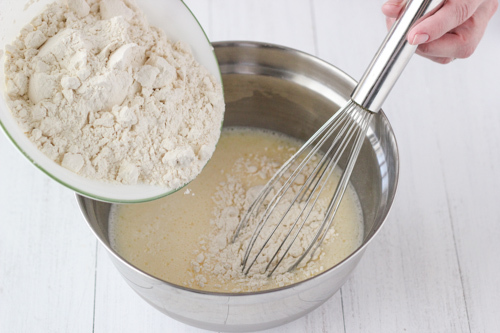 Add the eggs to the flour and milk mix in the larger bowl and keep whipping, gradually adding the melted butter (not hot) and the brandy (if you are preparing the sweet pancakes). Your pancake batter is ready. The batter should rest in the fridge for at least 30-45 minutes. Once you want to use it, mix it again for few seconds with a hand whip to better amalgamate the ingredients once more. Heat a non-stick falt frying-pan over medium heat. You can brush the pan with some butter, using a tissue or a paper towel both to better spread the butter but also to remove any extra butter (you don’t want the pancake to deep-fry in butter!). 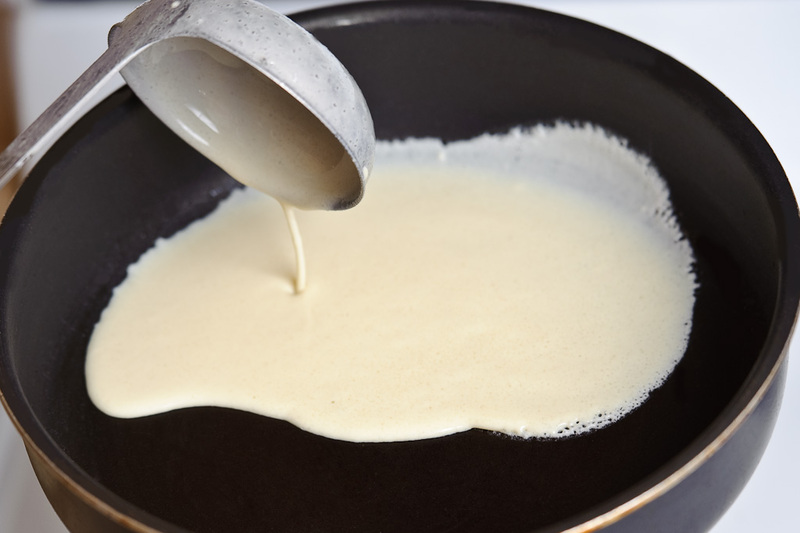 When the pan is hot enough, pour in some pancake batter in one go (using a ladle) and and tilt the pan in all directions to spread the batter until the pan is covered with an evenly-spread, thin layer of batter (I usually do it with a rotational movement rotating using my wrist while keeping the forearm still). Once golden on the bottom side, flip the pancake with a wooden or silicon spatula, to avoid scratches on the pan, and let the pancake cook on the other side. Now your pancake is ready to be filled and eaten! Simple…isn’t it? Now set your imagination free and create the most delicious fillings. 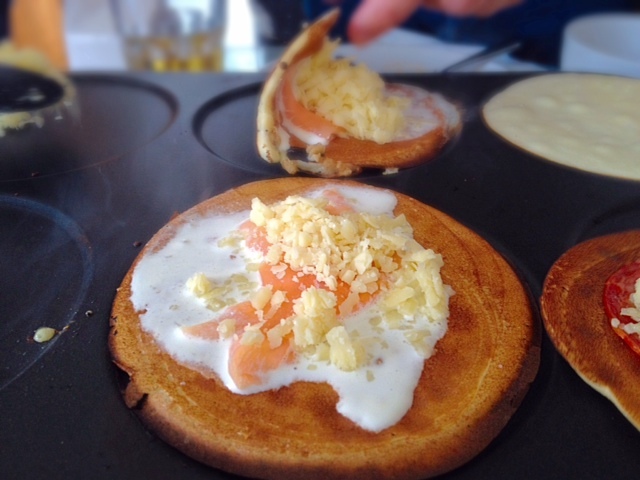 If you want some idea, check here to get some inpiration from my previous pancake dinner parties.